Smithfield Pediatrics uses the Patient Centered Medical Home model of care. PATIENT CENTERED is a way of saying that your child is the most important person in the health care system. Your child is at the center of his or her health care. A Medical Home is an approach to providing total health care. In a medical home, you and your child will join a team of health care professionals to help you with your child’s health care. The doctors and staff here at Smithfield Pediatrics are a part of your child’s medical home. 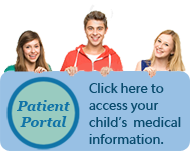 We are here to help your child reach his or her health care goals. We will coordinate your child’s care with other physicians to provide evidence-based care, along with self-management support. The Patient Centered Medical Home (PCMH) is a model that emphasizes improving and maintaining healthy lifestyles. We are committed to providing our patients with the support they need to manage their treatment plans. With a Medical Home, you, your child and your team will work together. As an active member of the team, you and your child will have a chance to explain things that are really important to your family. To assist us with providing the best possible care, you and your child will need to provide a complete medical history including any care your child has received outside of our practice. Children of any age can experience depression, anxiety, school and/or behavioral problems. Children may also need help adjusting to family changes such as divorce or new siblings, or to change unhealthy habits such as poor sleep or diet. Our providers are ready to discuss these issues when they occur. We also have in-house child and family therapy services available, as well as an extensive referral network of specialists to address your child or family’s particular needs, so please discuss these needs with your provider. We can also provide social work services. Smithfield Pediatrics accepts most health insurances. Please check with our staff to make sure your coverage is accepted. If necessary, we will work with you to establish a payment plan. Dinusha W. Dietrich, MD, Care Team Leader – supported by Allison Pennine, Medical Assistant.